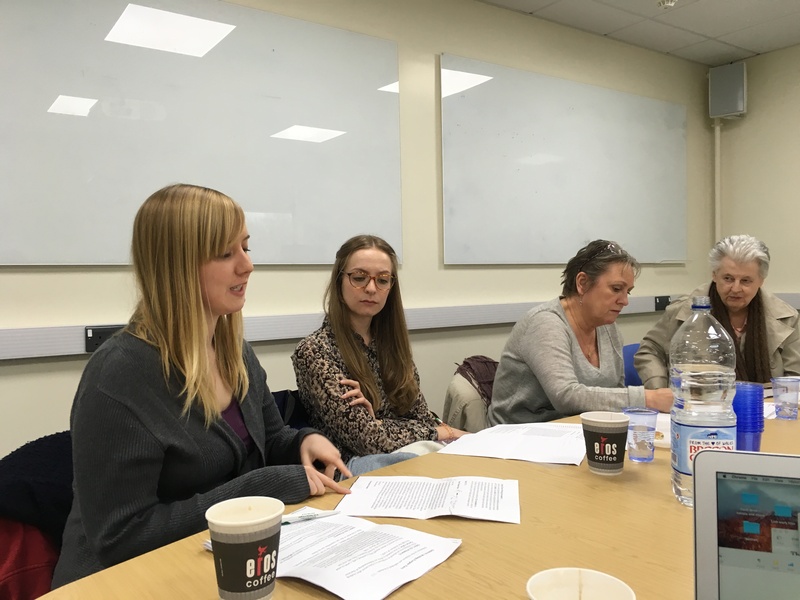 This page provides an edited version of a one-day seminar held at Cardiff University on March 1 2016. Its aim was to assemble a group of people who, from a variety of different linguistic perspectives, are all engaged in the analysis of texts, but who also have an interest in education, to illustrate the value of having a linguistic perspective on responding to children’s writing. (N.B. This approach was first reported in: Reading Children’s Writing: A Linguistic View (John Harris and Jeff Wilkinson (eds))(1986)(London, Allen and Unwin)). This new discussion by a group of university linguists (see below for contributors) on examples of writing produced by children (at Year 6 and Year 7) was to consider writing ‘effect’ in the context of purpose and reader-response within a linguistic framework. We first present Educational Implications which guided our discussions, followed by a very brief overview of the Language Approaches referred to in our discussions. The list of contributors is given after this overview and finally we briefly describe the tasks we discussed, with links to the children’s writing discussed along with the transcript of the discussions. It is important not to lose sight of language as a whole system while thinking about its parts…thereby enabling readers to appreciate the nature of texts as a whole, while being able to discuss meaningfully the contributions made by different aspects of language. There are three parties to every transaction that written language makes possible: a writer, a reader, and a text. And of the three, the text is the pivot. The following discussion explores the importance of this relationship. (3) The teaching of grammar in context (sentence and inter-sentential) and text activities and the use of an ‘appropriate’ metalanguage. A simple anecdote: Two boys in a primary school were discussing the draft of a story they had written collaboratively about a pig escaping from a farm. They looked at the sentences: The pig ran across the farmyard. Suddenly she heard the noise. One boy comments that it should say a noise and not the noise. The other boy asks why, and the first boy’s reply is: Because if it was the noise the pig would have been expecting it. 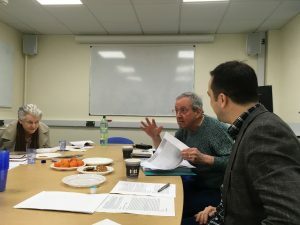 The discussion would seem to indicate that certain ‘aspects’ of grammar are more fundamentally relevant to the effective production of written texts than others: subjects; second person pronouns; sentence and group structures; reference; nominal groups; active/passive constructions; modality; verb processes. See also The National Writing Project. (7) Interactive comments between reader and writer. Much has been written about response to writing; and approaches are many and varied. Comments in this transcript would seem to indicate that some kind of response (from both teacher and pupil) is appropriate but how this can be most effectively achieved is open to debate, and very much dependent on teacher commitment. Discussion of the texts produces comments from three varied language disciplines, and their ‘top-down’ or ‘bottom-up’ approach has a lot to offer teachers, because, like them, it starts with an approach to written texts that is based on a careful overall intuitive response to the children’s writing. The responses are seen in the light of their own current preoccupations with language study. Systemic Functional Linguistics (SFL) is an approach to linguistics which views language as a set of resources from which choices are made, rather than, as is the case with many other approaches, as a body of rules. This chimes well with the approach of teachers who see themselves as extending the range of choices open to their students. As well as investigating linguistic choices, SFL also, more than any other approach, studies the contexts of situation in which language is used, and considers which linguistic options are most appropriate in which situations: for instance what options are appropriate in informal spoken situations and how do these differ from options appropriate in formal written situations. SFL is particularly concerned with meaning choices. What meaning options do we choose to represent the events and states of the world? What meaning options do we choose to bring about interaction with other people? How do we weave these two types of meaning together to form a text? When SFL is used in the classroom, the aim is to alert students to the choices open to them and to help them to choose appropriately. Berry, Margaret. 2016. Systemic Functional Linguistics and Students’ Writing. In Marcello Giovanelli and Dan Clayton (eds) Knowing about Language: Linguistics and the Secondary English Classroom. London: Routledge. Bloor, Tom and Bloor, Meriel. 2013. The Functional Analysis of English. London: Routledge. Fontaine, Lise. 2012. Analysing English Grammar. Cambridge: CUP. Thompson, Geoff. 2014. Introducing Functional Grammar, 3rd edition. London: Routledge. A great deal of work has been carried out in SFL on different genres. For more on this and for further suggestions for reading, see the entry below on Genre/Language-Based Pedagogy. Cognitive linguistics is an overarching view of language that on the premise that there are continuities between language and other cognitive systems, so that our linguistic capability is understood as one of a number of inter-related cognitive functions we use to learn and make sense of our surroundings and experiences. Using language means conceptualising events and experiences via our own species-specific bodies and therefore constructs a view of reality that is informed by our human capacities and limitations and by our interaction with the social and physical world. Some useful areas of knowledge for teachers include figure-ground configuration, profiling, schema theory, conceptual metaphor, and discourse grammars, such as Text World Theory. Cognitive linguistics offers a way for teachers to draw on the physical and experiential bases of meaning in the design and delivery of classroom activities, and provides an interesting framework for students and teachers to explore both social and psychological dimensions of language. Genre/language based pedagogy is above all concerned with the development of pupils’ and students’ literacy. A genre-based approach to literacy involves recognising the language features through which subject knowledge is expressed, centring upon the twin notions of register and genre: register refers to the ways in which individual language features combine within and across a text in the appropriate genre. For example, A diary entry (genre), whether actual or imagined, is typically written in the first person, with a mixture of present and past tense and includes the expressions of thoughts and feelings alongside accounts of day to day events, tied to specific days of the week in a consecutive linear way. Thus, the approach advocates explicit teaching of linguistic patternings in the context of, and a part of, rather than apart from, teaching and learning subject knowledge itself. To stay with the same example, asking pupils to write a diary entry would involve writing an exemplar entry and deconstructing it to recognise its linguistic patterning. Rose, David and Martin, James, R 2012. Learning to write, reading to learn: Genre, knowledge and pedagogy in the Sydney School. London: Equinox. Claire Acevedo (CA), a PhD candidate, Open University, UK, is a teacher educator from Australia, now based in the UK. She leads international literacy professional development projects for a range of organisations. Her expertise is in using Systemic Functional Linguistics via “Sydney School” Genre pedagogy to improve reading and writing outcomes for under underachieving students in all areas of the school curriculum. She specialises in delivering the Reading to Learn literacy acceleration program to teachers and teacher educators. Margaret Berry (MB), now retired, was Reader in English Language at the University of Nottingham, UK. She has published introductory books on systemic linguistics, and articles on systemic functional linguistic theory, context of situation, exchange structure, theme and rheme, register variation, and the application of systemic functional linguistics to the teaching of English. She has lectured in China, Australia and Canada, as well as in European countries. Her particular interest in children’s writing is in how children move from the informal spoken English with which they grow up to the conventions of formal written English. Recent relevant publication: Berry, M. (2016) Systemic functional linguistics and students’ writing, in M. Giovanelli and D. Clayton (eds) Knowing about Language: Linguistics and the Secondary English Classroom, London: Routledge. Urszula Clark (UC), is Professor of English language and linguistics at Aston University, Birmingham, UK. She has published widely in the areas of stylistics, grammar and literacy and language variation and identity. Her latest research is on developing literacy across the secondary school curriculum. Lise Fontaine (LF), is a Senior Lecturer in the Centre for Language and Communication Research at Cardiff University. Her research interests include functional grammar theory and, more specifically, the study of referring expressions as realised in the noun phrase. Her book publications include Analysing English Grammar: A systemic-functional introduction, CUP (2012) and The Oxford Companion to the English Language, 2nd ed. (OUP, 2018 with T. McArthur and J. Lam-McArthur). She has also co-edited the following volumes: Systemic Functional Linguistics: Exploring Choice (CUP, 2013); Choice in Language: applications in text analysis (Equinox, 2013); Perspectives from Systemic Functional Linguistics: An Appliable Theory of Language (Routledge, 2018) and The Cambridge Handbook of Systemic Functional Linguistics (CUP, in print). She is a functional linguist, on the cognitive side, and,for her, literacy is not exclusively an English subject and she hopes to help teachers to feel more confident in talking about language in whatever way that works for them. Sarah Jackson (SJ) (PhD Sheffield) is a doctoral researcher at the University of Sheffield, completing her PhD in English Language and Linguistics. Sarah’s research explores how concepts from cognitive linguistics can be applied to educational contexts, both at home and in the classroom. Sarah’s thesis, entitled Sharing Fiction: A Text World Theory Approach to Pre-school Children’s Experience of Story-time, focuses on the formative years of the cognition of literature and employs the cognitive linguistic framework Text World Theory in order to account for early shared reading experiences. Jess Mason (JM) is Lecturer in English Language at Sheffield Hallam University. Her research interests include secondary school English education, particularly studying fiction, cognitive poetics, intertextuality and reader response studies. She was awarded the Terry Furlong Award for Research by the National Association for the Teaching of English in 2015. She is particularly interested in how students talk about, and make associations with, set texts and other things that they read. Marcello Giovanelli (MG) is Senior Lecturer in English Literature at Aston University, UK. He has research interests in literary stylistics, cognitive poetics, reader response theories, and language and literature in education. Recent books include Text World Theory and Keats’ Poetry (Bloomsbury 2013), Teaching Grammar, Structure and Meaning (Routledge 2014), and Knowing About Language (Routledge 2016) as well as journal publications in English in Education, Language and Education, Children’s Literature in Education, and Literacy. Jeff Wilkinson (JW) is retired from Sheffield Hallam University, where he was a Senior Lecturer in English and Education. He is interested in both the primary and secondary range in relation to the teaching of literacy, with a particular focus on the writing process. A total of 6 different discussions of the samples are included. Each of the pages linked below presents first the student’s (or students’) writing, including a description of the task they were set, followed by the transcript of the discussion of the samples.